When Margo Guryan heard “God Only Knows” for the first time, she dropped everything. Raised on classical music and steeped in theory and composition, by the time she graduated college Margo seemed prepared for a serious career in Jazz music. But a friend played her Pet Sounds, that spiritual hymn, and her interests suddenly changed direction. Inspired, and working in the glow of Brian Wilson’s masterpiece, Margo released Take a Picture through Bell Records in 1968. It’s a beautiful, wistful, lost little gem that was too good to stay hidden long. The first thing you’d notice is Margo’s voice, a unique upper register whisper. More unexpected is the opening clatter of the record, when “Sunday Morning” bucks and tumbles in a strange stew of fine-tuned garage funk. Her fragile soprano trembles in and takes hold, coasting over dense chord changes. This is some serious pop. Chamber orchestra arrangements, session players not averse to psych touches, a Bach melody even graces the chorus of the adorable “Someone I Know.” The production is expert but not showy; it’s got an easy, relaxed feel, a marvel when you consider the complexity of the music. Margo didn’t support her record with performance and it fell to obscurity. Vinyl copies today are ridiculous. But at the turn of the century, Margo’s music was reissued by Franklin Castle. The renewed interest generated by the reissue sparked several further releases of Margo’s demo cuts and unreleased songs. Whether this collection is called Thoughts, 25 Demos, or included on the new Take a Picture (and More Songs) by Beatball (Korea), the recordings are all the same, and just as essential as Take a Picture. Driven by Margo’s Wurlitzer but cut with a full band, vocal overdubs, and plenty of decoration these recordings are hardly demos. Tracks not only includes most of those from Take A Picture, but also several unreleased outtakes and gems recorded for a potential second album. Several of these concern the Watergate scandal (foreshadowing Margo’s more current political involvement), including one of my choice cuts “The Hum,” a lovely melodic tribute to the blank sections of Nixon’s infamous tapes. OH SNAP! 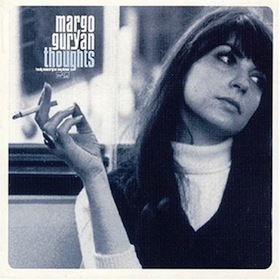 Margo Guryan is amazing. I discovered 25 Demos about three years ago and have been in love ever since. The fact that she’s a little better than the might Free Design is godlike. I hope to interview her in the near future, as she’s pretty good at keeping up with people on MySpace. Oh man. What a gem. It has a classic french sound without being french! Like a lost Francoise Hardy album. And that’s Bach’s Jesus Joy of Man’s Desiring intertwined in the chorus. Thanks so much for this…love it. By the way, I was looking at a an Andreas Gursky book and there it was: Los Angeles in all its splendor. Great pairing for the Drunkard. Good job. ‘someone i know’ is nice but the dominant melody is exactly that of bach’s ‘jesu, joy of man’s desiring’ and i can’t hear this song on its own merits. instead, its seems that the other rhythms are sputtering bursts interrupting one of the best, most famous songs ever created. maybe this is good too but it will take getting used to.